Charlton's Cedar Court has undergone extensive renovations. We invite you to check out our new look in the same great location in downtown Banff, close to the shopping and entertainment district. The atmosphere is casual and comfortable, a great place for families to unwind after a busy day of mountain activities. Gather around the fireplace in our newly expanded lobby, catch up with the news back home at the internet station, or enjoy a refreshing visit to the hotel's indoor pool, whirlpool, and steam room. We offer a variety of guest rooms including romantic loft suites with fireplaces, efficiency kitchenette suites, and deluxe guest rooms, all featuring serene and restful decor with a nature inspired palette and the warm tones of maple. The hallmark of our success is impeccable cleanliness and first class service. 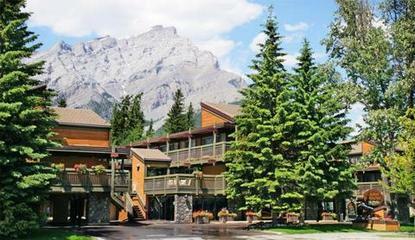 We look forward to welcoming you on your next visit to Banff. Complimentary: use of indoor saltwater pool, whirlpool, steamroom, coffeemakers, tea kettles, refridgerators in all rooms, plush terry bathrobes, daily newspaper service.